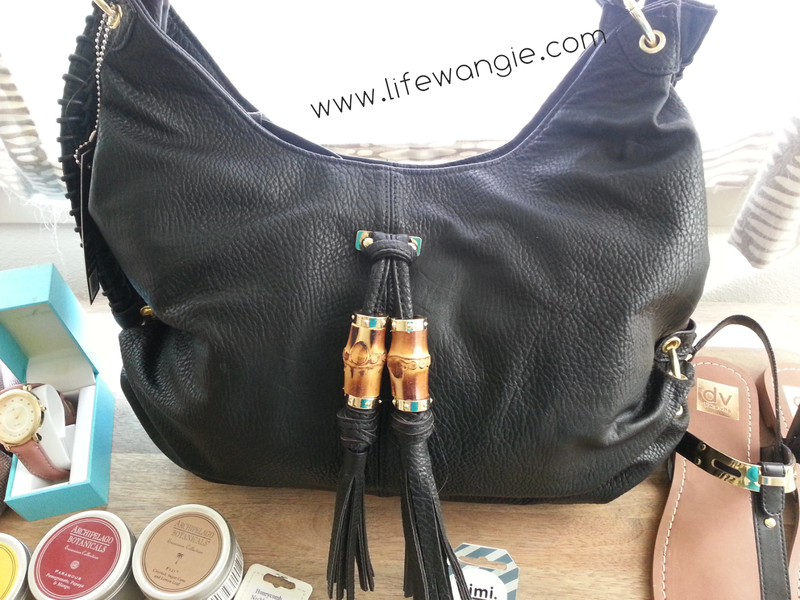 Life With Angie: Goodbye, Little Black Bag! Hello, Deals! Goodbye, Little Black Bag! Hello, Deals! Little Black Bag is a shopping site with a twist. You purchase an item and have the option to pay a few more dollars to "bundle" the item with a couple more, lower priced items. For example, you can buy a handbag or a pair of shoes and the bundle might contain a couple of pieces of jewelry. It's also a subscription service where you sign up to be a VIP, and you can pay $10 a month or skip. If you pay the money, you get credits to spend on the site, but I always skip because I can't figure out what the benefit to giving them my money to hold on to. The real fun begins after you check out. On Little Black Bag, or LBB as its frequent users call it, you have the option to postpone shipping and trade items with other users on the site! It's a very unique and fun experience, but it does have a dark side, so I haven't written about it before. 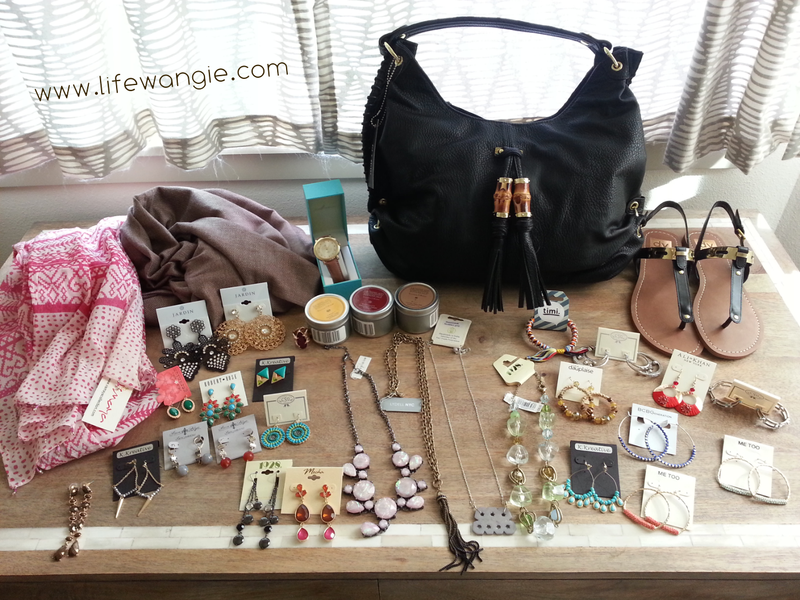 I'll get to that in a minute, but for now I wanted to show you my awesome LBB haul! That's one handbag, one pair of DV by Dolce Vita sandals, two scarves, a watch, three travel candles, and a whole bunch of jewelry. I spent $100 and traded for a week to get this stuff. I have actually never spent that much on LBB before, but it was my birthday and my husband was hemming and hawing about how he didn't know what to get me, so I took matters into my own hands, took my birthday budget and spent it on LBB. Let's look at my goods close up! I got these sandals through a promo they were having where they had a staff trader and you could offer low value items on high value items. I offered a really low value item on tons of stuff and got these sandals! There are a lot of really cute faux leather handbags on LBB. I have an ivory version of this that I got from them last year, and am excited to get the black one! 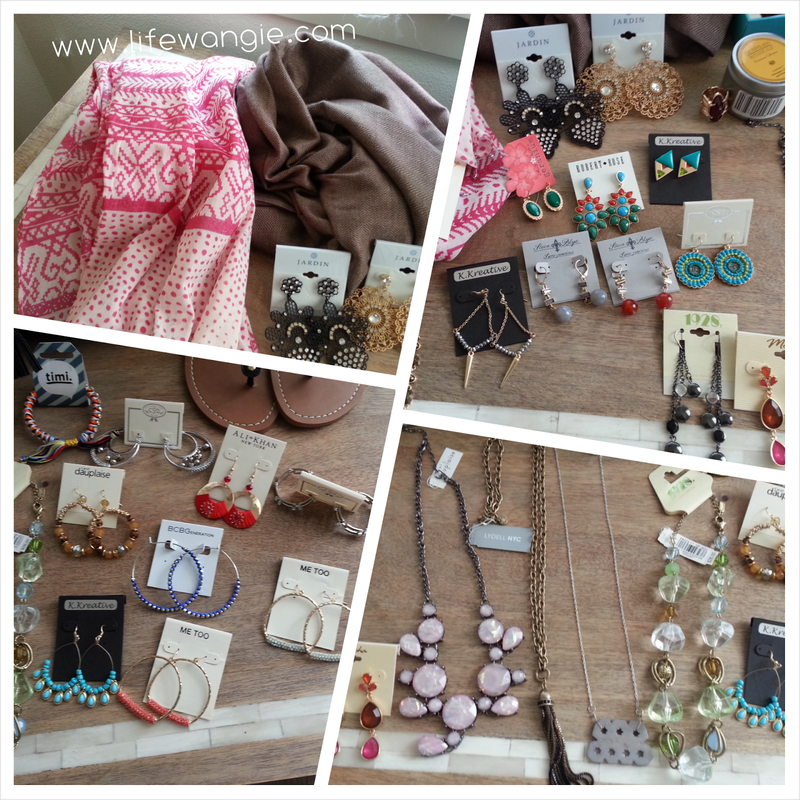 My favorite things to trade for on LBB are jewelry items. For some reason, people go nuts trading for bags, and just see jewelry as currency to trade with. So you can usually trade up jewelry very easily by continually offering all of your jewelry items on jewelry that is slightly more expensive (somewhere between $2-5 more in retail value) and after doing this a ton of times, you have quite a bit of value built up in your bag. Then at the end you can offer a bunch of jewelry on something of higher value, or you can be like me and just take home the jewelry. How do you get so much stuff for so little money? You have to strategically take advantage of sales, trading, and a bit of luck. Buy a bag with a hot item in it by looking for something that is trading a lot in the "news feed," or by scanning the chat room to see what people want. Be careful in chat though - there is a dark side to LBB where there are users who are on there All. The. Time., are a bit obsessed and can get very catty and take offense to really minor (or imagined) disrespectful trade offers. You kind of just have to ignore them- I've even had people on the site make threats that I would be "blackballed" and no one would trade with me because I committed the cardinal sin of offering a sale bag on a regular priced bag, but in fact that wasn't the case at all. Many of LBB's users don't even use chat, and those users are a small but vocal minority on the site and if you just ignore them and make reasonable offers on things, you can usually eventually get what you want, or at least you can get a lot of random stuff you never knew you wanted. Little Black Bag is actually going out of business and changing over to a strictly swapping website called Pose. So right now they are having HUGE sales. One day they had a deal where you purchased an item and got five free jewelry items in your bag! They've also had $10 bag sales, $10 shoe sales, and all kinds of jewelry and accessories sales. It's probably a good idea to sign up for their emails to check out the sales that are going on for the next few weeks. I do seriously need to caution you though- if you have any problems with spending, gambling or shopping addiction, you should stay away from LBB. It can be addictive and there are some girls who spend pretty much all of their waking moments on the site. There is a kind of a whole worldview and social community around the site, and some of it gets kind of dark. This is why I have never written about it before. I wasn't sure if I could really recommend it to people. But now that they are going out of business, there are tons of great deals to be had, and I wanted to let people know to get in on the great deals before they clear out their entire warehouse. I recall having used the site way back in 2011/2012, but I'm not that surprised it has since folded because I only used it that one or two times and decided the trading aspect wasn't for me. It suddenly popped into my head today so I had to check on its fate!